Terrorist infiltration, intolerance, apartheid, terrorist cooperation, support stabilization of terrorist policy and threaten be the First Global War. First progress of The Universalism in Sovereign Political rules, at now The Millenium 2000 ! Global Sovereignty of All Government Countries from around the World, common territory, common civilizations, common state, common jurisdiction, and only The One Universal Government, The World Diamond International Alliance. Histoy of Mankind, and Act's of Globalization, Declaration of The United Nation's organization as Global Inter-Governmental Office. 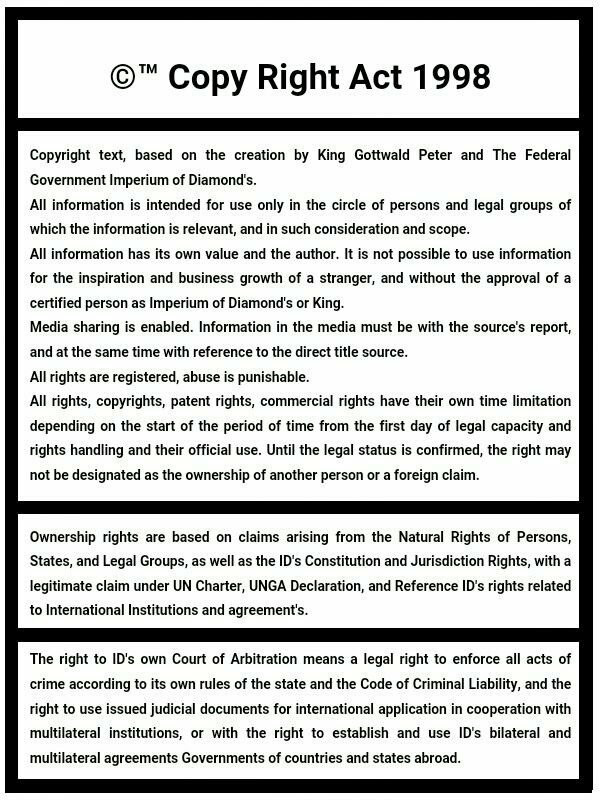 Today, Legal act of sovereignty World Diamond International Alliance as a Civilizational power under sovereignty of all government's of Human World. All Nation's, all States, all Government Countries, the One Common Territory & Civilization, The Universal Step ! Step for Sovereignty transformation is legitimed according The UN Charter as a Prevention against terrorism and crime, Rights of state for self-determination of sovereignty claimed today European terrorist regime, therefore duties and responsibility for The UNSC Rezolution of UNSC Strategy for Sovereignty self-determination and transform countries sovereignty AT, EU & International Terrorist's states into the form of The WD International Alliance right De Facto. Today situation of claim Quo Ante, Terrorists regimes automaticaly must losse their legitimacy and civilizations with sovereignty is change because the UNGA Declarations of the Prevention Act's form against bancrupt of state's and civilization's, genocides, war's and coflict's. Oposition against the Right's of The ID's World Diamond International Alliance is terrorism, fraud, attempt of Continental genocide and threaten for start of The First Global War ! If UNSC unrecognize right's, than UN Charter and UNGA Conventions is damaged, organizational fail. Next power after fail of UN, lis here automatical change and Great Progress, only one legitimed International form with possibilities for stabilization of Global Safety and Peace, Security and Economical stabilization, stability of regimes and governments worldwide, only The World Diamond is subject who can therefore have power, and start powerfull progress than "All time's of The UN". The World Diamond Constitutional Intelligency of Office, in the start is it powerfull subject than UN Organization. The World Diamond, International Alliance, this is our common sovereignty in the Europea terrorist countries alliance, and in the start much more than 15 Bilion planets in The Universe, the Five Galaxies with common power to outstrip our Civilization of The WD International Alliance into the next Supercluster's of Galaxies, One Trilions of planet's in The Universe. The most biggest step of mankind, and never, never, never can here stay any subject in the act of oposition, damage the rights or our cooperation, because every form of oposition is therefore only act of terrorism against the all countries and states around the world, the same as multyple opositional terrorism against all governments and countries, states or people in future time and history, the Mankind of The Future World. The most biggest traitorship against the humanity ! If the Subject in oposition have a attempt for damage rights of ID's The World Diamond, than the subject of oposition is therefore in the same responsible situation as the Adolf Hitler in time of the Second World War, and terrorist people of today. The World Diamond International Alliance is with all right for sovereignty, and we therefore never can losse it ! The New Step of The New Human Begining ! The Universalism ! The Rathaus Palace, future Museum center of The Austrian State History and International center of The Globalization Act's as part of the Austri pride for 1919 Independence from Fascist Nazi and I. World War, today support development of The World Diamond International Alliance and Legalization of Sovereignty in the country, one of the most important subject for the future world !